GORDONVILLE — I have a sports bucket list, which certainly varies from my overall bucket list of life and how I’d like to live it here on the back nine (rare golf reference, so call the papers that are actually still in business). Anyone who knows me, even a little bit, is aware that the Eagles winning a Super Bowl sits atop this list and is looking way down on all others. I would venture to say it laps the field so much that it occupies the top three spots. The thing is this – I’m not a greedy dude. I don’t need a dynasty. I don’t need three titles in four years or anything of the sort. My blood pressure probably couldn’t take it anyway. Just give me one and I’m good. And unless they are living under a curse, like the annoying Red Sox fans used to think they were under for selling Babe Ruth to the Yankees, it’s really not outlandish. It’s like a kid just listing one nice toy for Santa to bring on Christmas, as opposed to 171 stocking-stuffers. The Eagles have been around since 1933 (rising from the Depression-created ashes of the Frankford Yellow Jackets, who won the NFL title in 1926). Before we had Super Bowls, they reached the title game in 1947 and came back to win it all in 1948 and 1949. And they have the distinction of being the only franchise to beat a Vince Lombardi-coached team in a championship game when they captured the flag again in 1960. That’s all well and good. I can do book reports on all those teams that would be so detailed that would make my naysaying schoolmarm teachers from grade school jump out of their orthopedic shoes – not to mention their graves. I’m old, recently turning 50, but not that old. That’s five years after Glory’s Road underwent construction. The odds are really in my favor, as long as my health holds out. The Eagles have been to the playoffs a lot of times, and to the Super Bowl twice – once with me watching live – but until it happens, it seems like a dream for someone in a rent-a-city like Tampa Bay to enjoy. I often wonder what my reaction would be if the seemingly impossible happened. Would I spontaneously dance an Irish jig, jump so high that I’d land on the moon, scream until my larynx became dislodged or run down the street seeking out high fives from strangers until I found myself at the Lehigh Valley Airport (I guess I’d jump in a plane and – despite having no clue how to fly one – I’d pilot it back home)? Well, I had a test run Saturday, as one of the other items on my sports bucket list came to pass. 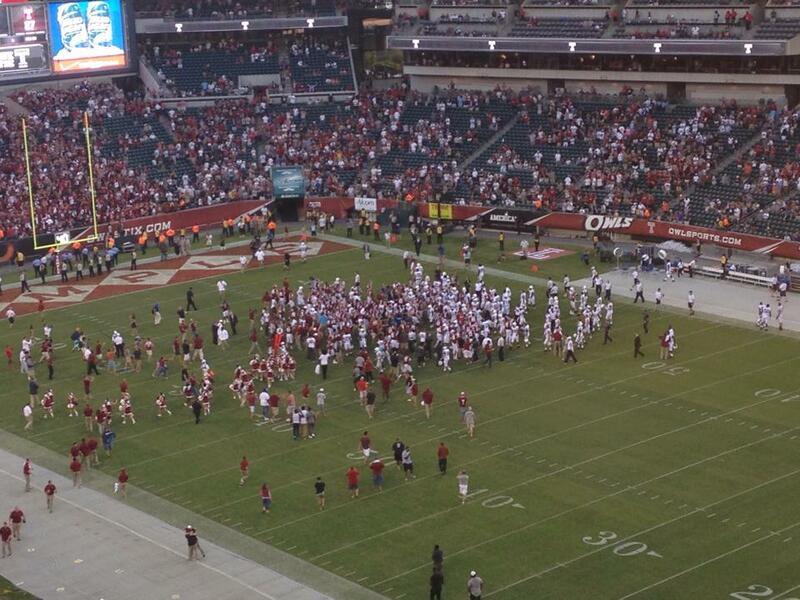 Temple beat Penn State – 27 to freaking 10! — in football for the first time since 1941. There were 39 meetings in there, with one tie. This was personal, very personal. My father had Temple season tickets, so I was at a lot of those as a tyke. At the time, I was also a Penn State fan, leaving a stench I still can’t wash away, but I put that allegiance off to the side in honor of a family tree where most of the leaves blossom as cherry and white. There were some games that Temple — where I attended myself, choosing it over Penn State and Kent State, and met my future wife — stayed in the same zip code on the scoreboard but really had no shot to win. There were some where the Owls were completely smoked, and Joe Paterno – great humanitarian that he was – ran up the score. But there were others – including very recently — where Temple not only could have won, but should have won. Just like EagleQuest, it only seemed like a matter of time. And like EagleQuest, there was no greed involved. Just one Temple win, creating sadness in Happy Valley, and I’d be set for life. But time was ticking, and not in my favor. With Temple in the ever evolving American Athletic Conference and Penn State plummeting to the middle of the pack in the Big 10, there was no guarantee that this semi-annual Pennsylvania waltz – that always ends with the same dance to the same sad dirge – was going to go on forever. I worried that it may not be in Penn State’s best interests to tempt fate and schedule a non-league game with a cross-state rival that treats the tilt as its Super Bowl when it could play the likes of Akron and Toledo. There was a sense of urgency this time around. I secretly felt the Owls had a shot. 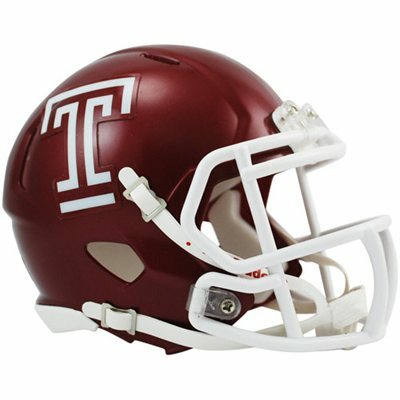 Despite “Temple football” always spoken like a punch line to a joke and with a roll of the eyes, the Owls were 6-6 a year ago and had a lot of returning players. Penn State was 7-6, the extra game by virtue of a bowl appearance that should not have been (but don’t get me started on that). Plus, it was the first game of the year. Weird things happen in Week 1. There are always upsets, and near-upsets, at all levels (prior to Saturday, Division III Ursinus beat Division II Millersville and Division 1-A Villanova hung tough against Division I Connecticut). 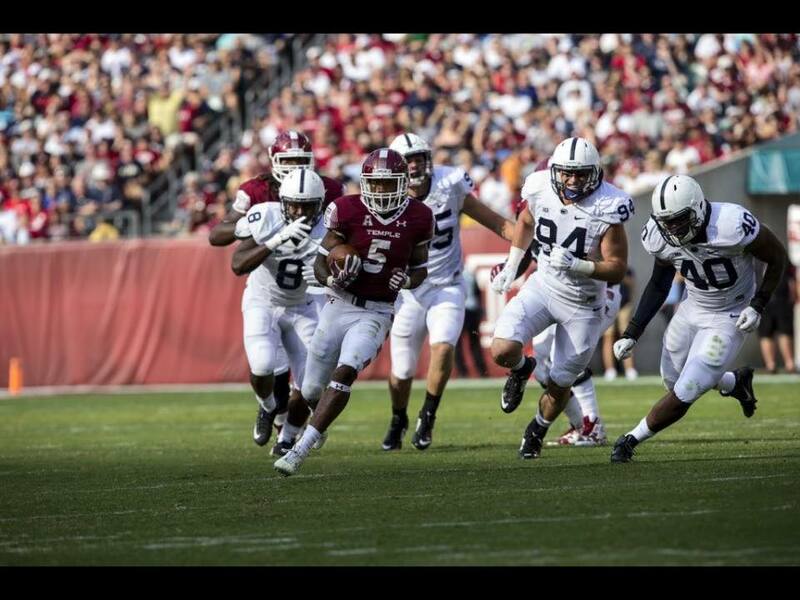 I was all Templed-up, in terms of dress, and had my enthusiasm dashed early, as Temple’s stout defense was gashed for a long touchdown run and the seemingly overmatched Owls fell into a quick 10-0 hole. “Gordon, you didn’t really think Temple was going to win, did you?” one asked. “No,” I answered, explaining that I thought Temple had to hold its own in the trenches, where it was at a size disadvantage, to prevail. Something happened. Temple got its equilibrium and started to own the line of scrimmage on both sides of the ball. A 10-0 deficit after one quarter didn’t feel so good, but 10-7 at halftime was a sign of life. Then it was 10-10. Then 17-10, Temple. Then, 24-10. Then, 27-10. The minutes ticked down, but I still braced myself for the great collapse of 2015. Maybe Temple would turn it over. Maybe Penn State would score on special teams. They all laughed when I said I been there before. They had no idea how many times, or how painful. Even though my neighbor was waving the white flag – and grudgingly giving Temple credit instead of pinning it all on Penn State failing to deploy a strategy to exploit Temple’s “inferior” talent – I needed to see Christian Hakenburg get sacked a few times and the clock hit zero. I was told my wife was outside on the back deck, irritating the Penn State neighbors on all sides by banging celebratory pots. My neighbor, who joked that he was going to call Homeland Security on me from running around his TV room yelling “Go Jahad, Go Jahad, Go Jahad” when Temple’s Jahad Thomas ran for a touchdown, followed me home and told my wife –jokingly, I think – that I wasn’t welcome to come back to watch any more games. I got to scratch one off the bucket list. And I got a real taste of what it would be like if the Eagles won the Super Bowl. After I got back into my house, I sat down on the sofa and removed my Temple cap. I buried my head in my hands and sobbed tears of joy for about five minutes. I could not help but think of my dad. If it were the Eagles, it would be longer. A lot longer. And now I believe the seemingly impossible can happen. I woke up Sunday morning with as much of an epiphany that a secular humanist who was raised Jewish could have. Reunite the Monkees. I’m a believer. I sat down worked out my NFL predictions for www.phillyphanatics.com. And I picked the Eagles to win it all. Gotta happen sooner or later, right? This entry was posted in Slice of Life, Sports on September 6, 2015 by gordonglantz.